Complete dedication to their craft is the commonality among the 400-student Corcoran College community, which includes an array of studies from screenprinting to light studies to art as social action. When Patrick Masterson rustled awake after an all-nighter for his ceramics critique last Wednesday, he accidentally knocked over a mountain of plastic cups and jugs that went crashing to the floor behind him. He was unknowingly playing into one of his friends’ pranks. The third-year student at Corcoran College of Art + Design said he had grown to expect the occasional prank from his classmates, who have also worked late into the night with “coffee pulsing in their bloodstreams” in their 17th Street building. On his third night with fewer than four hours of sleep, Masterson completed his 6-foot-tall ceramic pedestal. The next morning at his 8:30 a.m. critique, he earned praise from his professor and peers and said the work paid off. The complete devotion to their craft strings the 400-student Corcoran College community together, which includes an array of disciplines from screenprinting to light studies to art as social action. Attending art school is a badge of dedication, particularly at an internationally known school that accepts less than a third of applicants. But since Corcoran announced Feb. 14 that it would merge with GW, student morale has dipped as they heard stories detailing the financial struggles of both the college and the gallery. Some students said they felt like they were reading the Corcoran’s obituary. A week later, students were still welding and sculpting – practicing the daily routines that make the arts school hum. On Thursday, a group of students walked down a rusted-iron staircase to the welding room, where protruding pipes crisscross the walls and piles of scrap metal line shelves. They’re in the middle of critiquing a three-dimensional piece by student Brittany Moore. 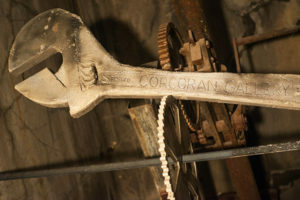 It’s a foam wrench that’s painted silver and jammed between two cogs and a bar that appears to be built into the basement’s walls. Brittany Moore, a student at Corcoran College of Art + Design, rubbed dirt from the building’s basement to make her wrench, which she made of foam and painted silver, to appear more authentic. Moore said she incorporated grime from the walls into her piece for a more authentic look, and her professor, Jonathan Latiano, thought it worked well. “I’d love to see a student not know, and see this and run around the hallways screaming, ‘There’s a wrench in one of the cogs!’” Latiano said. Besides the hesitation of graduating with a diploma from an institution they didn’t apply to, Corcoran students are now worried that their tight-knit college will be inundated with outsiders. The small undergraduate community – with most classes made up of a dozen students or less – operates on a first-name basis. Students know every face in the building and become close to professors whose classes they’ve never taken. Most students live off campus, though about 50 live in Corcoran housing at 2424 Pennsylvania Ave, which is roughly halfway between their downtown campus and the Georgetown campus. “Some of my students are very territorial of the museum-college model, it’s one of the last ones in the country and they’re afraid to lose that,” Latiano said. But as the dust settles in the week following the announcement, some students have started to embrace the potential opportunities from the change, such as access to GW’s 24-hour Gelman Library. The college’s only library building closes at 6 p.m.
Sophomore Elena Casey said the influx of 10,000 undergraduates to their small community will bring new doses of culture and perspective. Of all the perceived artist stereotypes out there, sophomore Elena Casey admits two hold true for Corcoran students: coffee and cigarettes. Many said the only characteristic setting them apart from non-arts majors is the passion for their creative pursuits above all else. It can be a tough sacrifice, particularly as 82 percent of graduates leave Corcoran in debt with an average of $46,000 owed. “I did my research before I came to art school. I knew that even having a master’s in art teaching, I’m probably going to be pulling in something from $40,000 to $60,000 a year in, like, a rinky-dink apartment, and I was fine with that because this is what I wanted to do,” Casey said. Casey, who is also the president of the college’s largest group, Spectrum, added that the influx of 10,000 undergraduates to their small community will bring new doses of culture and perspective. For sophomore Michael Schiffer, the D.C. location helps him network; he’s able to attend weekly exhibition openings and can work on projects with his professors, almost all of whom are still full-time artists. “The Corcoran as itself is a very strong brand, and coming into this school, it opened me up to this access and collaboration with artists that are not only faculty, but they’re also working professionals,” Schiffer said. The city also helps students garner internships at renowned institutions like the Smithsonian Museums and National Geographic, as well as chances to help out at shows for local and student artists. One of the prime moments for exposure comes during their senior show, “Next,” which takes over the museum’s second floor to display the students’ artwork. 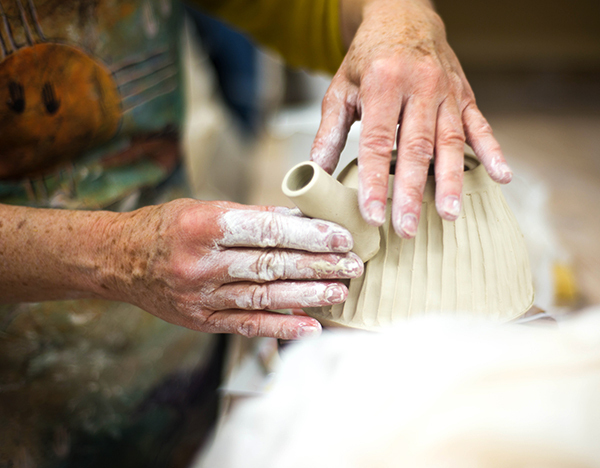 It’s received a reputation in the local art community as a preview of emerging artists. 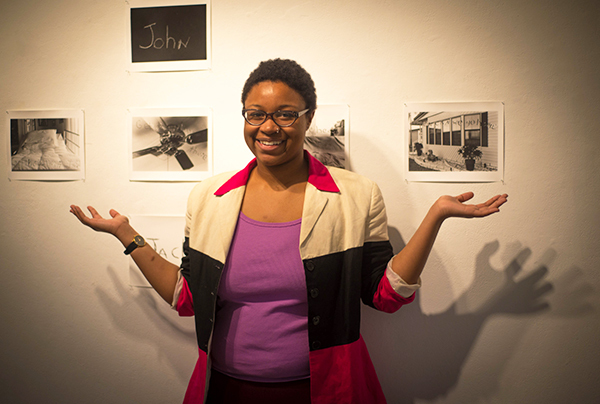 “Being able to show in a museum just as you’re getting out of college – that’s priceless in terms of a resume-builder. I mean, it doesn’t get much better than that in the art world, especially one as internationally renowned as the Corcoran,” Masterson said. The exhibition is not just about showing their artwork, Schiffer pointed out. The students must also prove that they can use their creativity to come up with solutions to problems as they run the days-long show. Due to an editing error, The Hatchet incorrectly reported that Spectrum was Corcoran College’s largest student groups. It is one of the largest, but not the largest.